Ever since returning from my year as an exchange student, I was kicking myself for not attending Australia Day in Sydney! Australia Day is regarded as a party day for Aussies the same way Americans regard the 4th of July. Being in Sydney for Australia Day is truly a Bucket List experience. 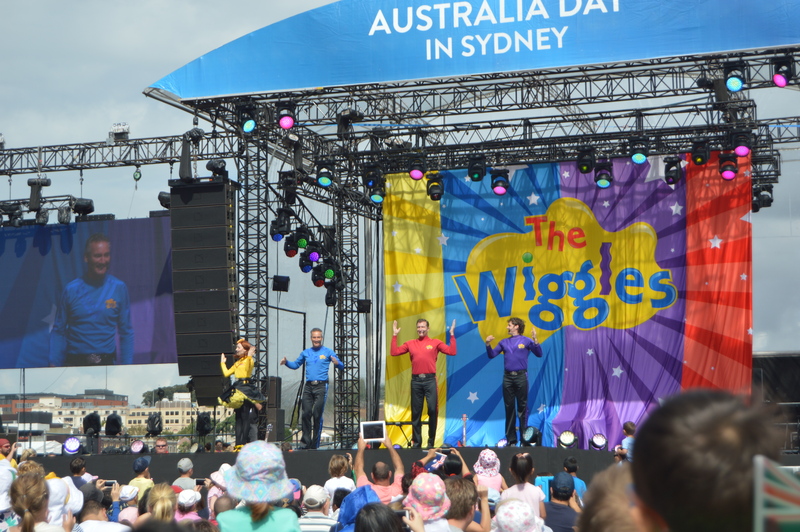 One added benefit of going to Australia Day in Sydney was that for the past few years, the date has included a special free performance by The Wiggles. The tickets are free, but are given out on a draw. We were lucky enough to secure tickets through a friend! 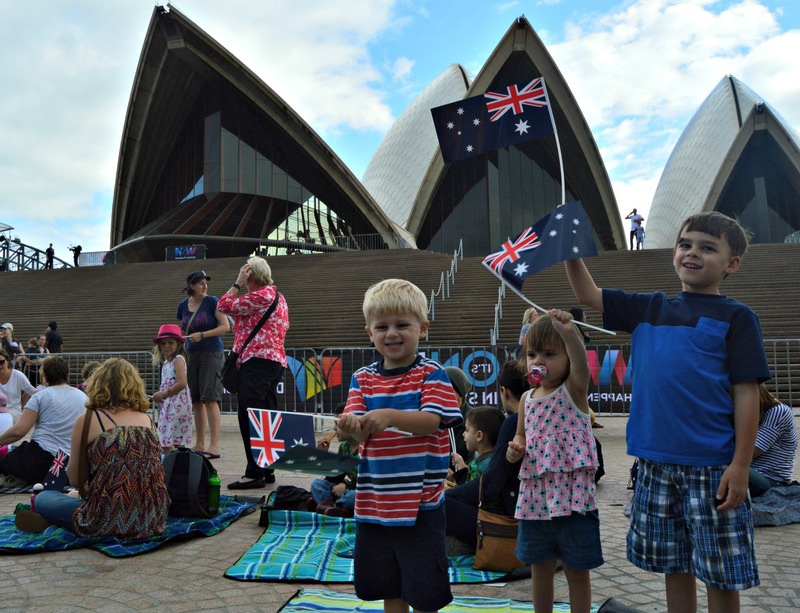 At the close of the Wiggles concert, we found ourselves in the perfect locale, as Sydney Harbour is the centerpiece for the Australia Day programming. 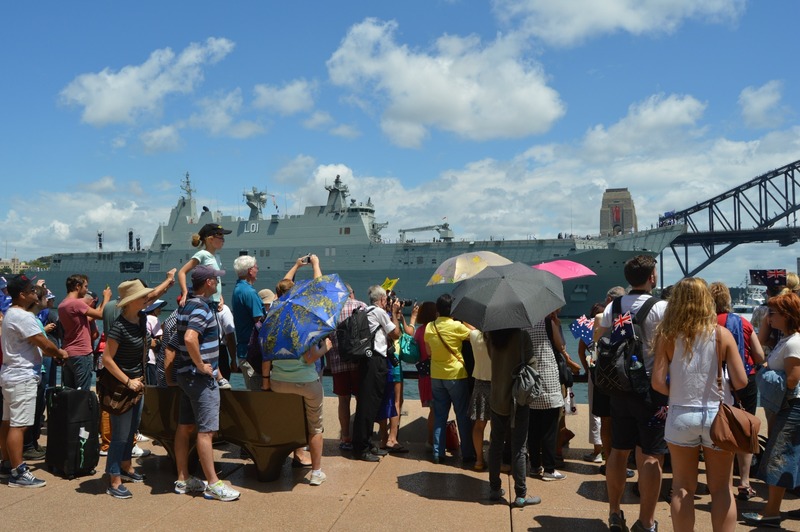 The Salute to Australia began at 12 pm from the HMAS ADELAIDE. 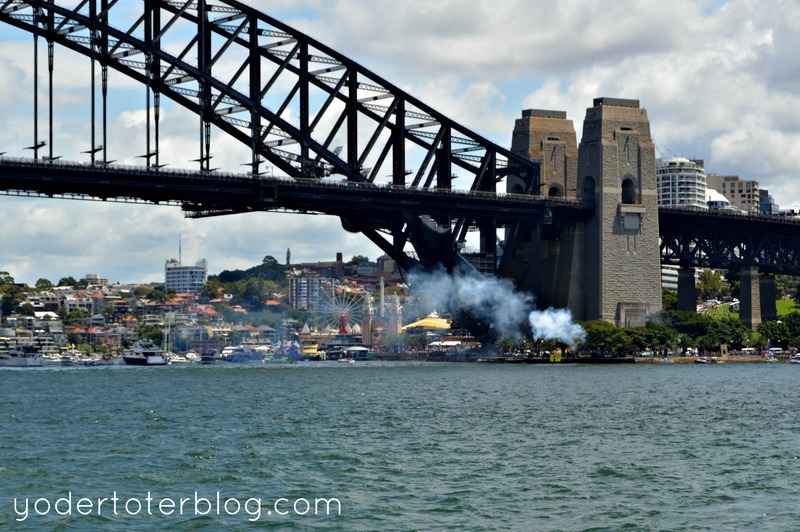 After a singing of the Australian National Anthem and “We are Australia,” there was a 21 Gun Salute in North Sydney and an aerial flyover of the RAAF fighter jets. (As a side note, I should have read the program about the jets because my word it scared the daylights out of Jackson and I)! After the jets came a pair of helicopters which I was sure were going to crash into the Sydney Harbour Bridge and plunged everyone into the sea (no anxiety here, folks)! Their maneuverings were quite spectacular- but not for the faint of heart! 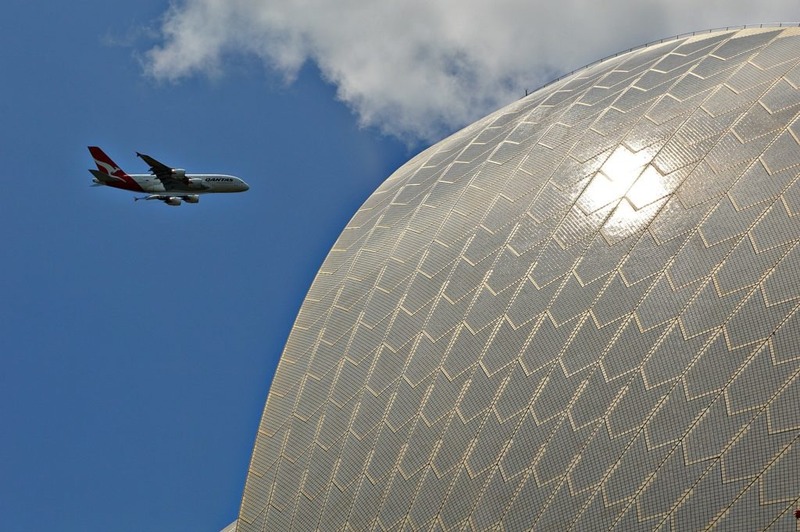 Maybe our favorite part of the ceremony was when the Qantas Airbus A380 did a flyover of the bridge and the Sydney Opera House. We’d just arrived 11 days earlier on the same aircraft, so it was neat to see the giant from below. After a quick lunch at the Western Foyer bar, we returned back to the water’s edge to watch the Tall Ships as they race from Bradleys Head to the Sydney Harbour Bridge. This iconic view is just what my mind went to when I thought of spending Australia Day in Sydney, now my only wish was that we’d been on the northern side of Harbour (just for the race, not the entire day), as we would have had a better vantage point. At the conclusion of the tall ships race, we returned to our hotel for a short rest and respite from the sun! Darling Harbour was another hub for Australia Day action, so after a rest we headed over to check out all of the hoopla. The evening activities in Darling Harbour were to include a live DJ and a fireworks spectacular. Unfortunately, after a full day in the sun, the heavy crowds of people were a little disheartening. Instead we chose to exit Darling Harbour and find a quiet spot for dinner. This was one of those times when traveling with three little kids meant plans sometimes change. The enormity of spectators, and our level of exhaustion from a full day in the sun, took a toll. If possible, go the night before. You’ll want to be in the city early in the day to begin your time at the festivities, so why not travel in the night before when crowds are few and enjoy a leisurely evening? 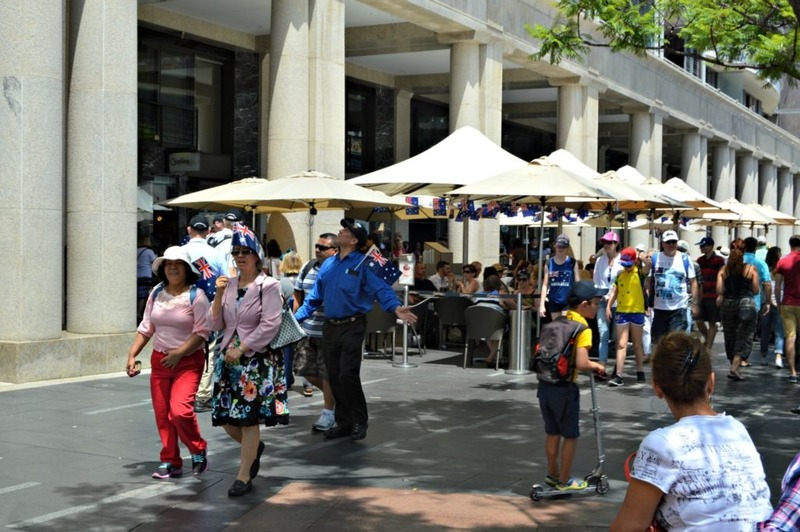 There were many kiosks along Circular Quay with Visitor Information and event listings. We grabbed a map and schedule for the next day so we could plan ahead. Sunscreen. Sunscreen. Sunscreen. At midday, there’s really no shade near the Opera House or Circular Quay. Most Aussies know the sunscreen/hat deal, but us Yankees totally underestimate the Australian sun. Be strategic with your hotel. We stayed at the Sydney Harbour Marriott (Check current rates). While expensive, the location in relation to Circular Quay can not be beat. When traveling with small children, you need a place that’s easy to access for naps and rest. If you have little children, ask for a tub at time of check-in. Our room only had a shower. A stroller is a necessity. The sidewalks of Sydney are handicap accessible. The only place we had an issue was in the Historic Rocks area where we got off of the beaten track and had to carry the stroller down a large flight of stairs. Around Sydney Harbour (Circular Quay) and Darling Harbour there are plenty of lifts (elevators) to get you where you need to go. The Opera House was open for the use of restrooms. This was convenient– and necessary. 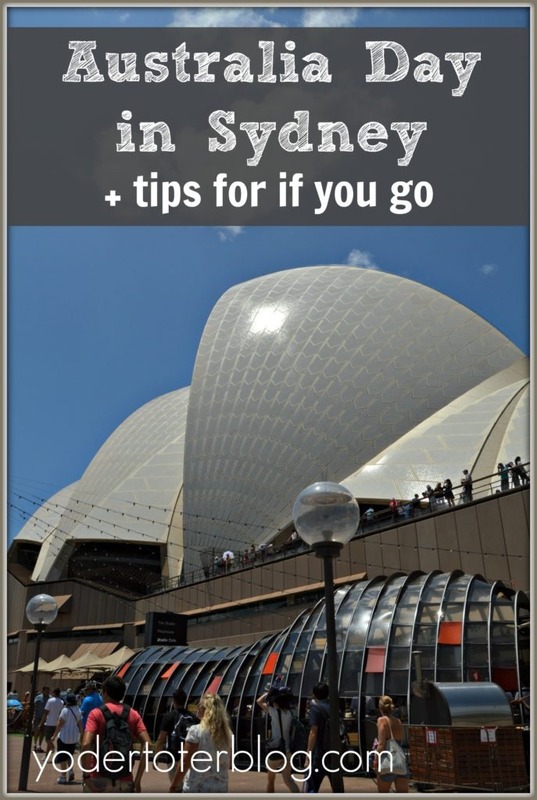 Not visiting on Australia Day? Here’s a list of great things to do in Sydney with kids any day of the week! I’d be amiss if I didn’t discuss the controversy surrounding Australia Day. 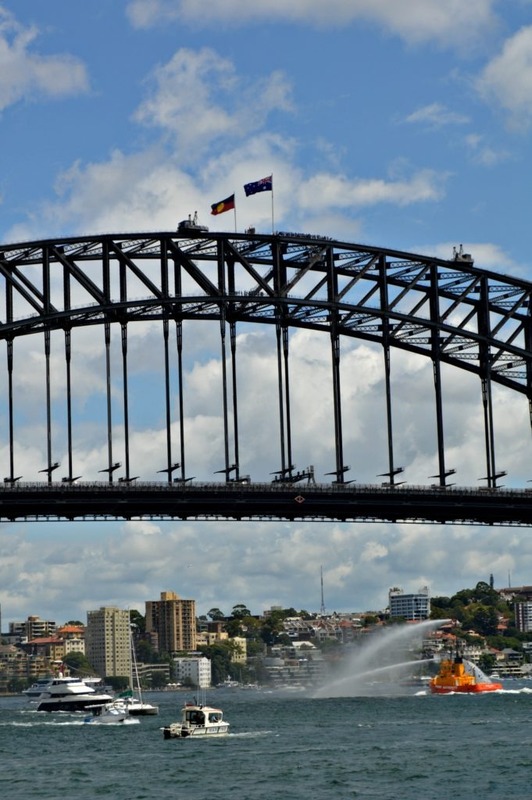 Australia Day commemorates the anniversary of Captain Arthur Phillip’s possession of New South Wales and raising the British flag over the bay in Sydney. Many Indigenous Australians refer to this day as “Invasion Day” and believe it was the day that they losts the rights to their land and culture. Throughout Sydney, Aboriginal programming was also taking place. You can learn more HERE.